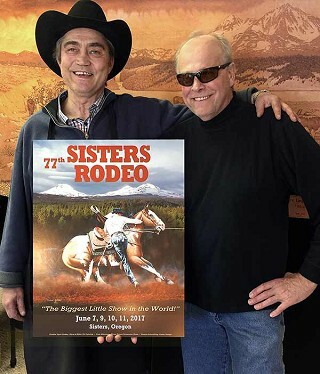 The 2017 Sisters Rodeo poster was an inventive collaboration by three celebrated Sisters artists: classic Western painter Dyrk Godby; international photographer Gary Albertson; and lifelong graphic designer Dennis Schmidling. The concept was developed by Schmidling to maintain the rodeo's tradition of presenting the landmark Three Sisters Mountains as a backdrop to a rodeo action scene. The finished work draws on the strongest qualities from the artistry of Godby and Albertson. "I believe the natural beauty of Sisters Country is what makes it the perfect stage for our world-class rodeo. Blending the fine artistry of Dyrk and Gary helps to enlarge this portrait beyond the rodeo arena and into the viewer's heart," explained Schmidling. Godby, who is one of the best Western artists in the nation, offered a tie-down roping cowboy dismounting quickly from a colorful paint horse. As a former rodeo competitor, Godby is able to transfer in elegant detail the exact action of a cowboy and his mount, down to creases in the cowboy's Wranglers that are part of the cowboy tradition. He is at the top of the heap when it comes to putting a brush to perfect anatomy of a horse. "In this piece, the horse's sliding stop is so good," Godby said of this work, garnered from a photograph taken many years ago at a rodeo he attended in the Southwest. He wanted to capture the professionalism of the cowboy and the horse. Schmidling called upon Albertson to find a striking background. Albertson agreed that one of his most popular photographs of the mountains could be the perfect complement to the painting. "This is one of my best images of the Three Sisters," he said. The photograph displays the rich, verdant forests surrounding Sisters Country with the brilliant snow-covered Sisters in dramatic contrast to both the forest and the deep blue sky. Albertson's photography is collected worldwide, from heart-stopping panoramic landscapes to passive time-lapses of his favorite waterways, guaranteed to cause an emotional response from viewers and collectors. From both artists' contributions, the poster is a near-gluttony of color. Their respect for the artistry of the other contributor is almost palpable. Schmidling, a 50-year veteran of graphic design from a national company to Georgia Pacific and Crown Zellerback, produced the final product with print additions and oversight. He is zealous about placement and perspective, making him the ideal graphic artist for the coordinated effort. The rodeo association is excited about venturing into new territory with this poster. "I am very pleased to have this collaboration representing Sisters Rodeo," said Rodger Dwight, rodeo director responsible for poster generation and sales. "It is an outstanding piece of art." The poster is available at several outlets in Sisters, including the rodeo ticket office, Sisters Area Chamber of Commerce, The Dirk Godby Gallery, Sisters Gallery & Frame and Open Range. In Bend, it can be purchased at The Boot Barn and High Desert Feed. Sisters Rodeo will begin June 7 with Xtreme Bulls followed by four rodeo performances June 9-11. For tickets and information, call the ticket hotline at 541-549-0121 or 1-800-827-7522, or visit the ticket office at 220 W. Cascade Ave. in Sisters. For information visit www.sistersrodeo.com.